This version has all the features of the Professional version, except for printing and data exporting. 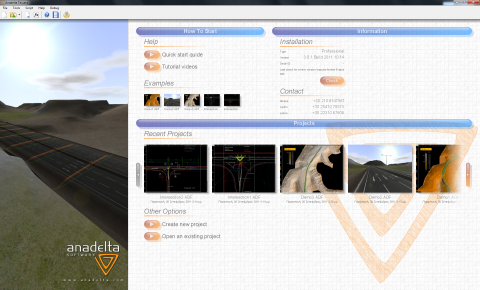 Anadelta Tessera is a multifunctional, highly configurable highway design and construction program. New work environment with support for docked windows and multiple simultaneous views. New hierarchical architecture for object properties. New Object Inspector with a multitude of new visualization, grouping and processing capabilities. New terrain model features such as full support for layers, new rendering options, new WYSIWIG printing engine, parametric simplification, etc. New volumetric capabilities such as center of mass calculation, filtered average slopes, ability to print graphical results, export them as solids and produce detailed tables of all prism coordinates, areas and volumes that can serve as deliverables. New unified diagrams for each road, facilitating project management. Anadelta Software celebrates 20 years of continuous innovation in the field of road design software development by offering a 20% discount on new purchases of Anadelta Tessera.